NORTH CHARLESTON, S.C., Oct. 17, 2016 – Boeing (NYSE: BA) today recognized multiple suppliers and partners for their role in coordinating shipments of relief supplies from Seattle to North Charleston to support Boeing teammates and the local community recovering from the effects of Hurricane Matthew. The first shipment of approximately 4,000 pounds of supplies arrived at Charleston International Airport on Monday afternoon thanks to the generosity of Alaska Airlines. Alaska provided cargo space free of charge on four of its nonstop flights from Seattle to Charleston. 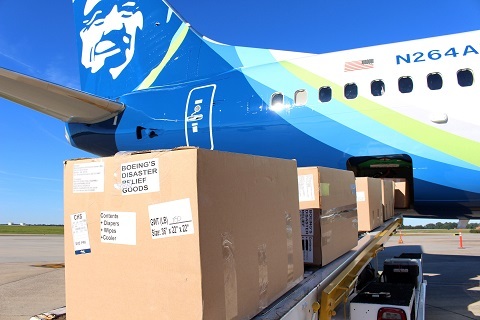 The first shipment of approximately 4,000 pounds of supplies arrived at Charleston International Airport last Monday afternoon thanks to the generosity of Alaska Airlines. Alaska provided cargo space free of charge on four of its nonstop flights from Seattle to Charleston. “As Seattle’s hometown airline, it was an honor for Alaska Airlines employees to partner with Boeing to support employees and the citizens of Charleston at such a critical time,” said Joe Sprague, Alaska Airlines senior vice president of external relations. Subsequent shipments last Wednesday, Friday and Sunday added 18,720 pounds of supplies. Relief supplies included bottled water, diapers, blankets, trash bags, sanitizing wipes, snacks and other provisions. Boeing Shared Services Group, under the leadership of the unit’s president, Beverly Wyse, helped coordinate all the moving parts necessary to pull off this special mission quickly. Seattle-based employees with Yusen Logistics (Americas) Inc. provided facilities for initial receiving, sorting and packing as well as delivery of goods to Sea-Tac Airport. Alaska Airlines coordinated flight schedules and arranged for cross-country shipments to Charleston this week. Upon arrival, Eurest provided additional food and bottled water, and freight forwarding and support for local deliveries of assets to the Boeing South Carolina facility. Contractor Skanska USA provided space within the decorative paint facility for staging of supplies until it could be sorted by Boeing volunteers. A portion of the shipments is being donated to the local American Red Cross to aid them in helping Charleston-area families as local storm recovery continues.